As someone in charge of technology operations, the future of your organization depends on your ability to deliver. Visibility into your entire infrastructure, applications, services, and all other moving parts is a must in order for you to succeed. 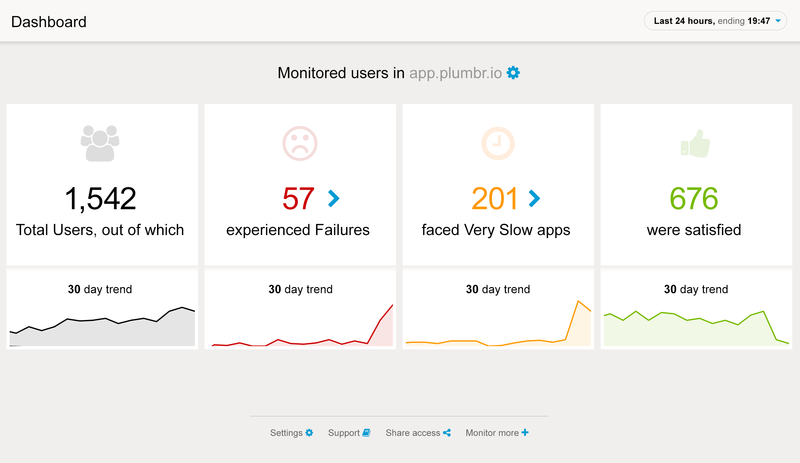 With Plumbr, you will gain the dual benefits of real user monitoring and application monitoring. This means transparency into the usage of your applications from the perspective of users who are interacting with your software. It also means the entire technology landscape of your organization is automatically visible to you. One of the important features of Plumbr is the ability to visually represent the architecture of applications and services in what is termed the Runtime Application Architecture. As applications that are monitored using Plumbr are used, distributed traces are built. The architecture is derived from these distributed traces as they pass along various nodes, exercise different services, and interact with other applications. Whether your organization uses monoliths or any type of modern distributed applications, Plumbr can built a 360° view from which you can operate them successfully. Here is a simplistic case of an application architecture generated using Plumbr. It can be interpreted as a front-end application which has users interacting using the URL www.sample.app. Traffic from this application is serviced using the frontEndApplication JVM. This in-turn interacts with a cluster of JVMs labelled the businessLogicCluster. Downstream from this cluster is a database labeled PostgresDB which is the database powering the application. No matter how complex your infrastructure is, an RAA gets generated for it. Front-end applications/APIs. The interfaces through which your end-users are interacting with your applications. Application backend. The various nodes your application is composed of. Clusters. Different backend nodes that are organized as clusters and not individual backends. Downstream integrations. Any services that the backend nodes connect in order to deliver a service. Edges. The volume of traffic, measured as interactions, that any part of the application receives. 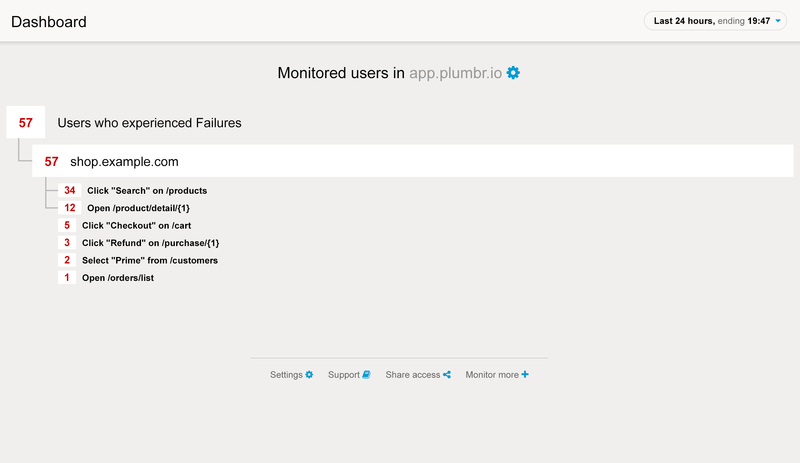 Since Plumbr has two facets to it – real user monitoring and application monitoring, it allows you to choose which part of it that you want to view using the RAA. The RAA can be modified to present the relevant aspects of the application. Not just that, you can modify the architecture of an application by changing the filters. Picking a date range will show you the architecture specific to that date range. All three approaches have inherent advantages and it is a question of choosing what works best for the particular technology challenges that a team is facing currently. Discovery of poor architectural decisions while designing microservices. For example the cyclical dependencies between different microservices are immediately exposed thanks to this view built by Plumbr. Uncover security irregularities on your infrastructure. Any test nodes connecting to production services, non-SSL access to the production sites, and many such cases can be caught using the RAA. Would you would like to gain advantages like these for your organization as well? One of our technical consultants can show you how to get started for free. Plumbr can work with your existing infrastructure, tools, and processes without any modifications.